Eastern Europe has a love affair with all things preserved and sour. Vinegar, pickles, yogurt, sour cream, pickled cabbage, etc. It's probably to do with the necessary preservation techniques to help food last through the cold, hard winter. This Russian/Ukrainian recipe is no exception. 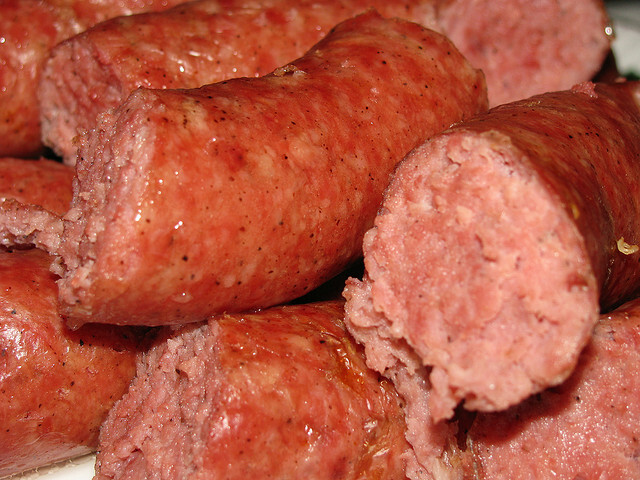 I had a kielbasa in the refrigerator that needed to be used. 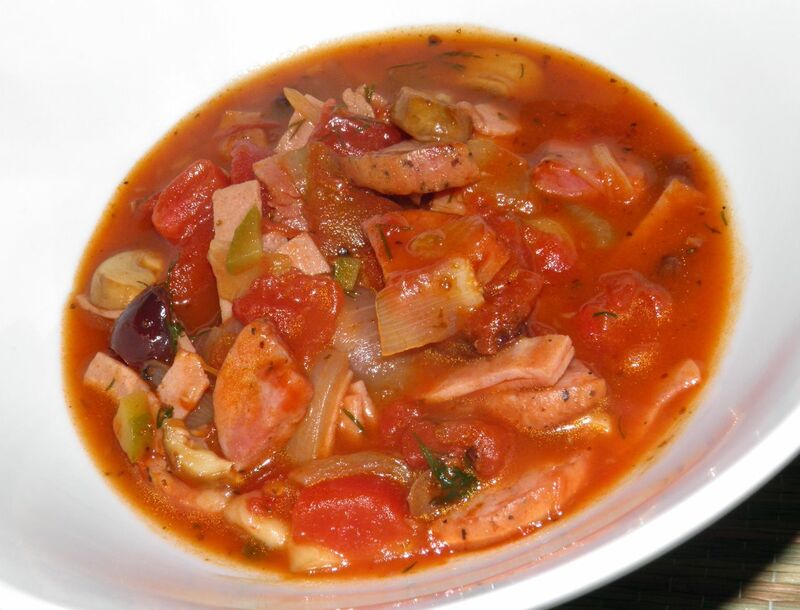 That’s why I wasn’t really surprised by the flavours when I stumbled upon this kielbasa soup. What intrigued me was it that had dill pickle as an ingredient. I don’t think I have ever cooked anything hot with pickles in it before. It was about time to fix that oversight. The few recipes I found all had very interesting ingredient lists. For example, besides the dill pickle this recipe also has capers and kalamata olives. I had some kielbasa that needed to be used. This is a combination of a few recipes I found. It came about mostly from what I had in my pantry, keeping the purchases to a minimum. I didn't mind taking liberties with this dish. This is really a country kitchen meal. Some recipes had cabbage, some pickled mushrooms. Perhaps even others contain the kitchen sink. Solyanka recipes are of three different types: meat, fish or mushroom (for all you vegetarians). The meat type most closely reflects my recipe. Meat solyanka usually contains tomatoes, onions and dill. The fish variation has vegetables cooked in the broth and is finished with lemon. The mushroom version has cabbage and bread crumbs and is usually baked briefly. It's amazing what you can find online. Much of what I have learned about the different types I gleaned from the encyclopedia “wikitannica.” What did we ever do before the Web? If you’re looking for a little culinary adventure – but not too, too much – seek out Eastern European recipes. I usually enjoy dishes from that area. They remind me sightly of some of my own family recipes. I have German ancestry fairly close to the surface on both sides of my family. So I’m no stranger to hearty one-dish meals. And cured meats, and sauerkraut. In fact I believe I’m expanding my personal tradition with this blog. Many of my recipes dirty only one pot, or two at most. I hate dirty dishes. You know what I mean? This soup turned out quite nicely. The broth is slightly thickened, rich and full of interesting flavour. The combination of spices isn’t usual to North American tastes but it certainly works. Because of all the ingredients each spoonful is a little bit different. And the kielbasa and ham add a smokiness. This really hits the spot on a cold day. You would never even know it had pickle in it. Chop the onion, garlic and mushrooms. Melt the butter in a soup pot. Add the onion, garlic and mushrooms and cook for about 4-5 minutes until the mushrooms start to brown slightly. Add the diced meat and stir well. Let cook for a few minutes. Then add the beef broth, tomatoes and their liquid, tomato paste and the vinegar and sugar. Bring to a simmer. 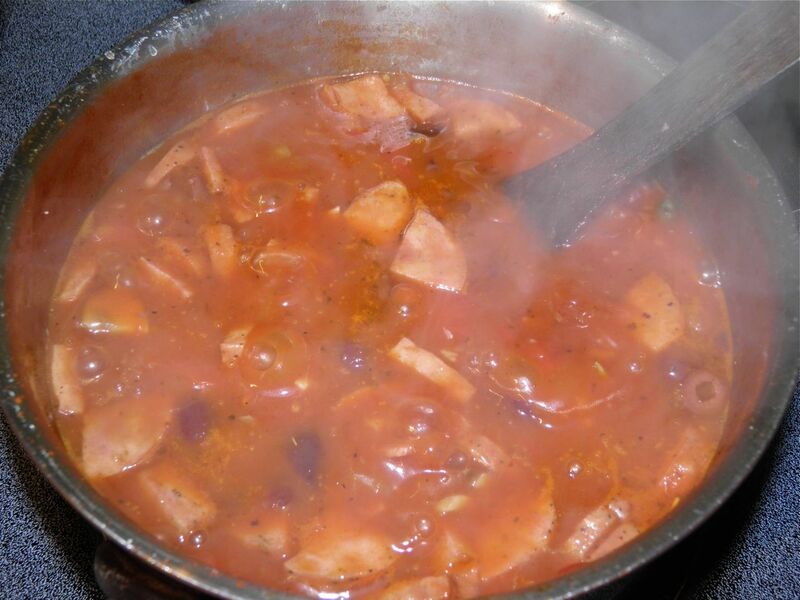 Once the soup is simmering, mix the flour and water to a smooth paste and add to the soup. Let cook to thicken. Then add the remaining ingredients, except for the dill. Reduce the heat to medium and let simmer for a further 5 minutes. Just before serving stir in the dill. Taste for salt and pepper and adjust seasonings. Serve with crusty bread to sop up the juices. If desired, ad a dollop of sour cream to the centre of each bowl.